Always amusing how playoff stats are separate from regular season stats. EDITED, BECAUSE I AM AN IDIOT: Game 4 wasn’t a grand slam. This is what happens when I get too happy. I promise, it won’t happen again. Stay safe out there, everybody. You remember that rain delay, right? When the skies cleared, Jayson Werth tied the game in the bottom of the ninth with a monstrous home run. Well, Charlie and Dave sure didn’t forget it when they called Werth’s epic Game Four walkoff. Stay safe, Nats town. When this rain delay we call winter is over, we’ll be back at the park soon enough. And now let us praise Jayson Werth, whose walk-off home run tonight allowed this miraculous 2012 Nats season to continue. Fans who were privileged to watch it in person will have thousands of stories. But if all of them were to tell all of their stories all at once, the roar would not be one-tenth as loud as the roar of the crowd at Nats Park tonight. This was probably the loudest I, personally, have ever heard the park. It was certainly the loudest I had heard it since the debut of Stephen Strasburg. Loyal Nats fans will probably recall Charlie Slowes’ account of the home run–which perfectly captures the utter emotional release of the moment. The rest of the baseball-watching public will probably remember this image of the walk-off: the ball sailing into the visitors’ bullpen in left field, touching off absolute bedlam at Nats park. 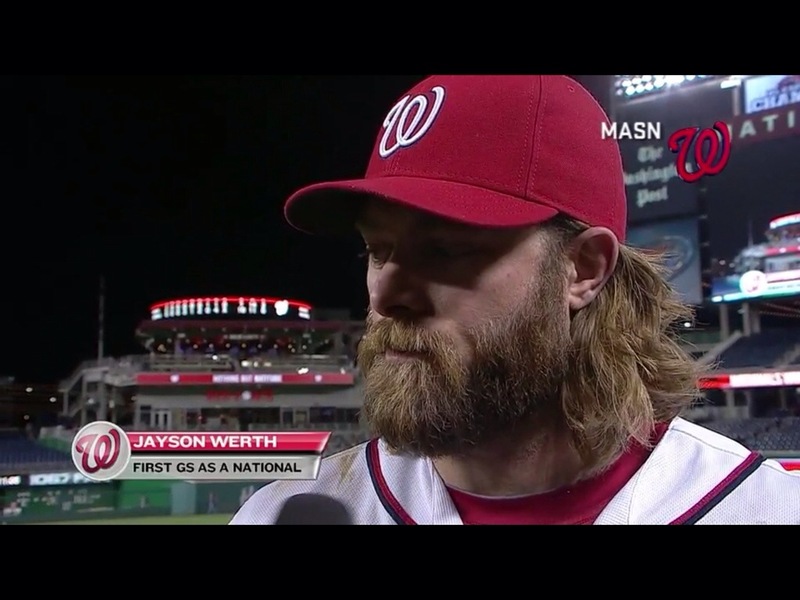 But perhaps the best way to understand Jayson Werth’s walk-off tonight is this video–a pitch-by-pitch account of the entire thirteen-pitch at-bat that culminated in the home run. Werth fouled off six pitches, took a two-strike curve for a ball, before crushing the thirteenth and final pitch into the left-field bullpen. Werth’s two-strike approach tonight was as cool as a Test Cricket batsman at his crease, methodically wearing down Cardinals reliever Lance Lynn. It was precisely for this type of performance that the Nats paid such an extravagant sum. I counted myself as one of Jayson Werth’s detractors during the 2011 season, particularly during the miserable month of June, where he went .154/.291/.286 with 25 strikeouts. His 2012 season, however, has been a tremendously pleasant surprise to me. At the close of the regular season, he batted .300/.387/.440 and posted a wRC+ of 129–roughly the level of his 2008 and 2009 seasons with the Phillies. Tonight’s walk-off is just another example of Werth’s tremendous 2012 season. He may not be my personal favorite National, but Jayson Werth has earned my respect–and my full-throated, roaring acclamation. In Rizzo We Trust: the motto of the day in Nats Town. I hope you all enjoyed the off day as much as I did. No, that’s a lie. I hope you enjoyed it better than I did. I felt like I had nothing to do. I watched a Hong Kong gangster flick that was pretty good, but not nearly as fun as watching the Nats these days. It’s a wonderful life in Natstown, by the redoubtable Dave Huzzard. If we imagine that Stephen Strasburg had never been a National…the 2012 Nationals would still be in contention. So relax. The Artist Formerly Known as Oleanders and Morning Glories takes yet another overly sentimental column from Boz apart in a post that deconstructs the “studious pirate ship” image of the Nats front office. Read this story by the Post’s James Wagner regarding the continuing standoff between the Nats and the Orioles regarding Nats TV revenues on MASN. The standoff continues, the arbitral panel has not issued an award, and the difference between the parties amounts to $100 million dollars. For those of you who want to think of things in concrete terms, that’s just 12 million less than the remaining value of Jayson Werth’s contract.